This product is a 20 PCF (air-dried density) gypsum plaster/exfoliated vermiculite spray-applied formulation 100% free from asbestos, mineral fibers, polystyrene and cellulose. This product can be troweled to a semi-smooth finish or painted, without loss of acoustic performance. Use for interior renovation projects and new construction where abuse resistance is required, such as hotel lobbies, atriums, schools, restaurants, commercial interiors, and any other area requiring decorative plaster and sound absorption qualities. Also, use on suspended ceilings as a combination acoustical finish and decorative. Detailing all Pyrok Acoustement products is similar to working with stucco and traditional three-coat plaster. 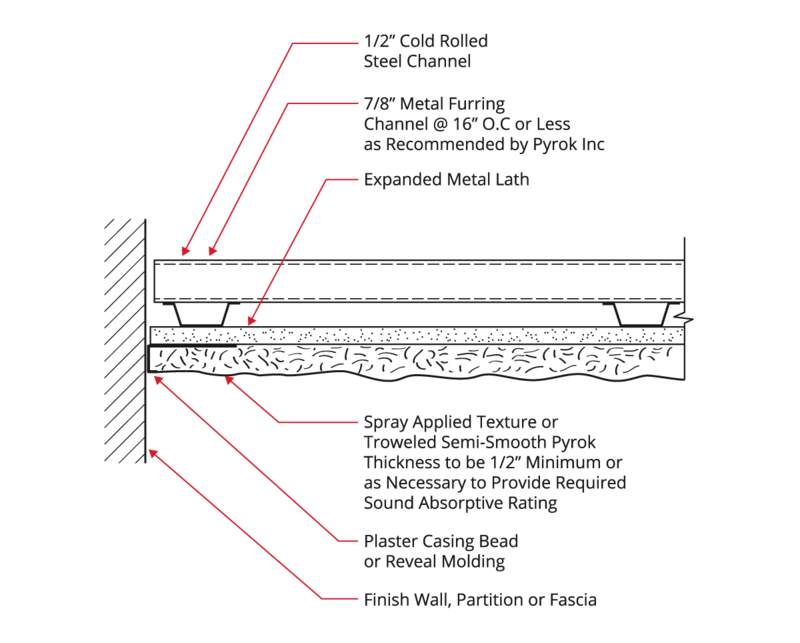 Utilize metal and plastic screeds, beads, reveals, J-molding and corner aids; as well as wood trims and Fry Reglets conforming to the thickness of the acoustement desired. All Pyrok Acoustement products can be applied to different thicknesses to achieve optimal acoustical performance. Acoustement Plaster 20 is gypsum-based and is typically applied to drywall substrates. Drywall should be a minimum 5/8 inch thick and the framing should be 16 inches on center or less. Drywall joints require a level 4 finish. Pyrok Acoustement Plaster 20 PCF (air-dried density) gypsum plaster/exfoliated vermiculite spray-applied formulation 100% free from asbestos, mineral fibers, polystyrene and cellulose. Pyrok Acoustement Plaster 20 has excellent adhesion to plaster substrates, and allows substrates to breathe. Pyrok Acoustement Plaster 20 can be used as a decorative surfacing material, an acoustically attenuating surfacing material or as a combination of these qualities. This material is recommended for interior applications where abuse resistance, but not contact is required. Typically, Pyrok Acoustement Plaster 20 is specified for use in hotel lobbies, atriums, schools, restaurants, commercial interiors, and any other area requiring decorative plaster and sound absorption qualities. It can also be used on interior surfaces of walkways, hallways, and rooms where a purely decorative finish is desired. Pyrok Acoustement Plaster 20 may also be used on suspended ceilings as a combination acoustical finish and decorative material depending on the structural configuration and building use. Custom integral coloration is available within the limits of iron oxide pigmentation. Pyrok, inc. recommends application of Pyrok Acoustement Plaster 20 be performed only by approved Pyrok applicators. An approved applicator list is available from Pyrok, Inc.
Pyrok Acoustement Plaster 20 may be applied directly to gypsum wall board, cement board and other clean, sound substrates. Contact Pyrok, Inc. for verification of compatibility with substrate and suitability of primer. Mix in mechanical type mixer with paddle or ribbon type blades. Use 5-7 gallons of clean, potable water per each 35 pound bag of Pyrok Acoustement Plaster 20. Mix 1 to 2 minutes. Spray-apply using equipment recommended by Pyrok, Inc. Air supply at the spray nozzle shall be 30-40 pounds per cubic foot. Brush or roll-apply a liberal coat of Plasterweld/Weld-Crete to the substrate immediately prior to the application of Pyrok Acoustement Plaster 20. A splatter coat of Acoustement Plaster 40 is then applied and allowed to dry overnight. Depending on the final thickness of the Acoustement Plaster 20 system, additional coats of Acoustement Plaster 40 may be required. Desired thickness of Pyrok Acoustement Plaster 20 may be applied in coats up to 1/8 inch to 1/4 inch thick per application. 2-3 days of drying time will be required after 5/8 inch thickness has been applied and additional thickness is required. Previous coat shall be allowed to set. 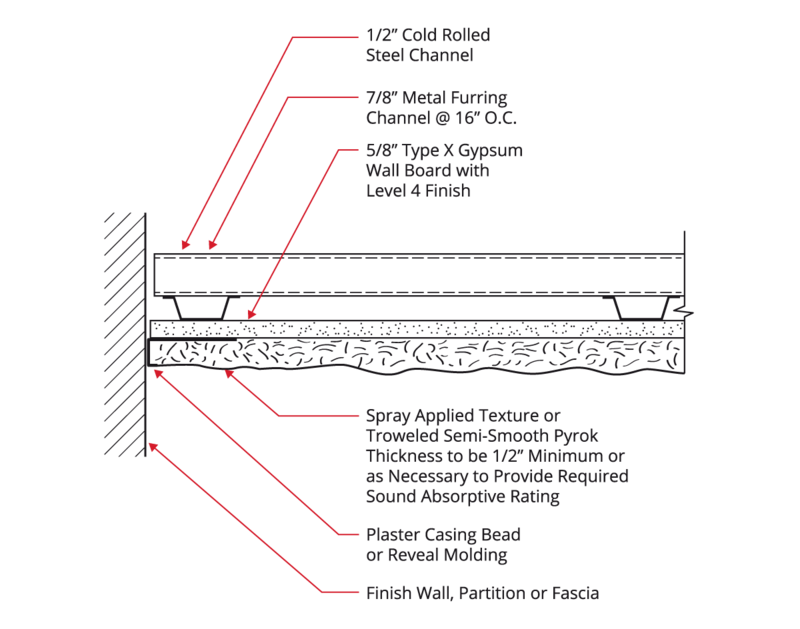 Where thickness of the Acoustement Plaster 20 system is to exceed 1 1/8 inch, or existing paint is not removed, chicken wire or metal lath must be fastened to the substrate. During application and drying of the Acoustement Plaster 20, temperatures should be maintained between 50 – 95 degrees Fahrenheit. The humidity should be maintained between 45% – 75% for proper application and drying. Pyrok Acoustement Plaster 20 may be supplied in several integral colors. Consult Pyrok, Inc. for further information regarding suitable topcoating and curing compounds. Contact Pyrok, Inc. or your construction representative for patching or repair procedures. Wet Pyrok Acoustement Plaster 20 may be removed by brushing or with water. Dry Pyrok Acoustement Plaster 20 may require scraping or chipping to remove. Pyrok Acoustement Plaster 20 may be vacuum brush cleaned after set. Store Pyrok Acoustement Plaster off the ground in unopened, original packages and kept dry. Pyrok Acoustement Plaster 20, kept dry, has one (1) year shelf life. Manufacturer warrants the material to be supplied, agreeing to replace that which has cracked, flaked, dusted excessively, peeled or fallen from substrate, or otherwise deteriorated to a condition where it would not perform effectively as intended for fire protection and sound absorbent purposes; due to defective materials and not due to abuse, improper maintenance, unforeseeable ambient exposures or other causes beyond anticipated conditions by manufacturer. The warranty period will be 10 years from date of installation. Manufacturer’s liability under any expressed or implied warranty is limited solely to replacement of Pyrok products proved defective and does not include labor or other consequential damages. The suitability of the product for any intended use shall be solely up to the user. The express warranties set forth herein are in lieu of all other warranties, express or implied, including without limitation, any warranties or merchantability or fitness for a particular purpose. In no event shall manufacturer be liable for any direct, indirect, incidental or consequential damages resulting from any defect in the material even if manufacturer has advised for the possibility of such damages. A. Extent of sprayed on decorative/acoustical insulation is indicated on drawings. B. Provide testing results and procedures which have been certified by Cedar Knolls Acoustical Labs or other independent testing laboratories. Thickness of test samples must be determined and reported by acoustical laboratory. Nominal thicknesses are not acceptable, unless peak thicknesses are also reported. 1.NRC not less than 0.65 at 1 inch thickness and coefficient not less than 0.40, + or – 0.03, at 250 Hz. Conduct testing on solid backing with no air gap. C. Installer: licensed by manufacturer. D. Control Sample: Prior to installation of final coat, apply an area of 50 sq. ft. in presence of architect, for approval of finish texture, as selected from samples. A. Submit manufacturer’s installation instructions, test data substantiating compliance with quality assurance. B. Submit 12 inch square sample of sprayed on insulation showing texture variations for approval. Resubmit as required until approved. All samples must be certified by manufacturer that they are representative of the texture which was acoustically tested in supporting acoustical test reports. C. Submit test reports from all suppliers showing material to be 100% free of asbestos, mineral fibers, polystyrene and cellulose. D. Submit certification of applicator licensing. E. Submit acoustical test data for specified finish. A. Keep material dry until ready for use. A. Manufacturer shall warrant the material to be supplied, agreeing to repair/replace that which has cracked, flaked, dusted excessively, peeled or fallen from substrate, or otherwise deteriorated to a condition where it would not perform effectively as intended for a sound absorbent purpose; due to defective materials and not due to abuse, improper maintenance, unforeseeable ambient exposures, or other causes beyond anticipated conditions by manufacturer. The warranty period will be 10 years from date of substantial completion. A. Materials shall be Acoustement Plaster 20 manufactured by Pyrok, Inc., Mamaroneck, N.Y. (914) 777-7070, or equal. B. Color shall be ___________ selected by the architect. C. Texture shall be (semi smooth) (semi-smooth trowelled finish). D. Thickness shall be __________. A. Examine all substrate and conditions. B. Assure substrate is free of oil, grease, dirt, paint, or other matter which would impair bond or install metal lath as recommended by the manufacturer. C. Do not proceed until said substrate and conditions are acceptable. D. Prepare substrate by filling voids and cracks and offsets, remove projections that result in telegraphing presence of imperfections. E. Prime substrate with primer or bonding agent as recommended by the manufacturer. F. Do not apply insulation material when temperature is below 44 degrees F (ambient), or substrate is below 40 degrees. G. Mask all adjoining surfaces in order to minimize damage from overspray. H. Provide ventilation if required, and avoid excess drying rates. I. Provide tarps or temporary enclosures as necessary to confine operations. J. Perform all patching and repairing of insulation required to be done due to cutting, etc., by other trades. A. Apply in accordance with manufacturers printed instructions using any rotary stator plastering pump or other spray equipment approved by the manufacturer. B. Install to thickness indicated or thickness required to achieve NRC specified. C. Ensure that texture and color are all as per control sample. A. Remove overspray and fall out materials immediately upon completion of the work in each area. Clean surfaces to remove evidence of soiling. Repair or replace damaged work surfaces to acceptable conditions. B. Coordinate work with other work, to minimize possibility of damage to insulation resulting from performance of subsequent work. As other units of work are completed in each area, patch damaged areas or surfaces of insulation by over spraying to match original installations, or by patching procedures as required to provide acceptable results. Acoustical Finishes from Pyrok™, Inc. The Acoustement Plaster 20 acoustical finish system consists of a spray on, trowel finish surface manufactured from a gypsum base. Acoustement Plaster 20 is 22pcf density. The system can be installed on ceilings, walls, and other interior features where a high level of abuse-resistance is required. If a suspension system is required for the installation of Acoustement Plaster 20, the sustainability of the suspension system can also be considered. New York City Department of Buildings Report of Material and Equipment Acceptance Division, MEA #376-88-M. Provide access doors if required for commissioning or maintaining building systems located above ceilings. (measured in accordance with DIN 5036 – Radiometric and Photometric Properties of materials). (measured in accordance with DIN 52613 – Thermal Insulation Testing; Determination of Thermal Conductivity by the Tube Method when tested in a horizontal position). Packaging: 35lbs bags packaged in paper-polyethylene lined bags. Scrap: See Article 10 and 12, below. Acoustement Plaster 20 sound absorptive finish contributes to control of reverberation within classrooms. Acoustement Plaster 20 can provide noise reduction coefficients (NRC) up to 0.80 at 1-1/4” thickness. (measured in accordance with ASTM C423 – Sound Absorption and Sound Absorption Coefficients by the Reverberation Room Method). See comment on lighting efficiency at EA credit 1, above. No criteria have been identified. The light weight of the Acoustement Plaster system minimizes energy expended in transport. No by-products are produced in the manufacturing process. No toxic or hazardous materials are used or produced. See MSDS. Unused finish coat materials can be saved for use on other projects. The light weight of Acoustement Plaster 20 materials simplifies handling and reduces installation energy use. The acoustical properties of Acoustement Plaster 20 ceilings improve the acoustic quality of a space. Studies have shown that building occupants are more satisfied and productive in optimal acoustic environments. Acoustement Plaster 20 is mold resistant. 100 percent of demolition debris may be recycled as a fill material or roadway base material. The Acoustement Plaster 20 is durable and can last the life of a building with minimal maintenance. The surface can be vacuumed with a stiff bristle brush. Small smudges can be removed with a soft pencil eraser. If necessary, the Acoustement Plaster 20 can be painted without loss of its sound absorbing properties. 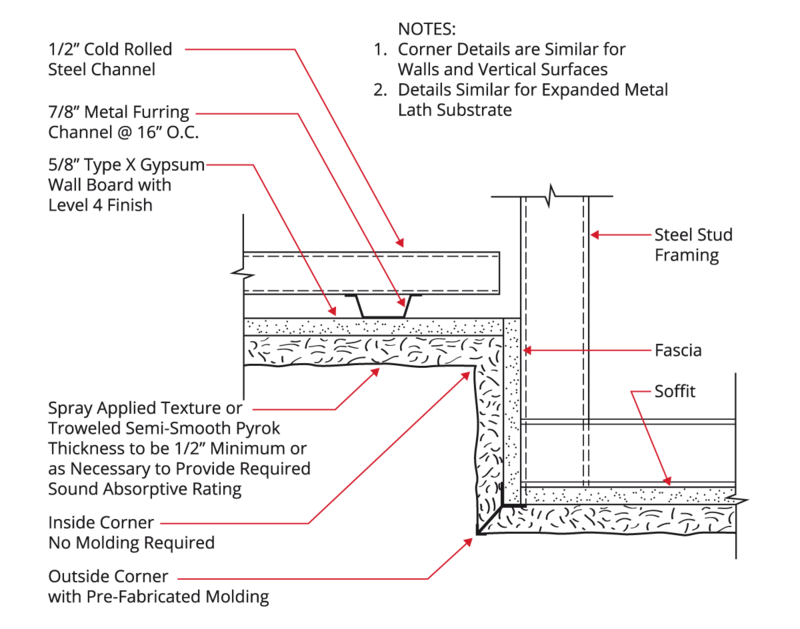 The information provided herein concerning the sustainability of Acoustement Plaster 20 Acoustic Plaster Finish is true, correct, and verifiable. *GreenFormat is a format for organizing information pertaining to the environmental sustainability of building products. It is being developed by the Construction Specifications Institute (CSI). At the time this document was issued, GreenFormat has not been finalized. **EQ Prerequisite 3 – Minimum Acoustic Performance is currently only located in the ‘LEED for Schools’ Program.